Although a year has passed, not a day goes by without Meggie thinking of the extraordinary events of Inkheart, and the story whose characters strode out of the pages and changed her life for ever. But for Dustfinger, the fire-eater, torn from his world of words, the need to return has become desperate. When he finds a crooked storyteller with the magical ability to read him back, he sets in motion a dangerous reversal that sees the characters of Inkheart transported to a charmed Inkworld, about to be fought over by rival rebels and princes. 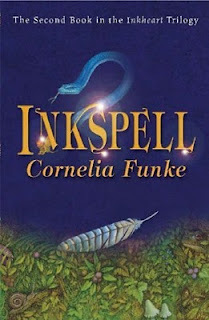 Far better than its predecessor Inkheart, Inkspell managed to draw me in despite pools, elephants and the Indian Ocean (I was in Kenya). Particularly the end of it was captivating, and I almost regretted not bringing the third and final book in the trilogy, Inkdeath. The characters have evolved, and Meggie and Farid are growing up and turning into very interesting characters to follow. Dustfinger is back in his natural element, and Mo is as strong as ever. Fernoglio is one of the most horribly arrogant characters I've ever read about and I loved it. In-story he's the author of Inkheart and now he's *in* the actual book and he thinks himself Godlike over the rest, having created them with his pen, back in the real world - it's a bit Inception like, really. I always did love the notion of being able to read a story to life, and it is taken to a higher level in Inkspell, as they must use their abilities to try and alter the story they find themselves in after having been read into it. Interesting, I couldn't put Inkheart down when I read it but I've started reading Inkspell various times and just got so bored that I couldn't get into it. I keep hoping one of the times I pick it up I'll manage to finish it.